Catch a special screening of this new documentary about the largest group of cantors ever to return to Poland since World War II, as they perform at the site of the Warsaw Ghetto. The film explores the history of Jews in Poland, the origins of Chazanut (Cantorial Music), and the re-emergence of Jewish life and culture in Warsaw. 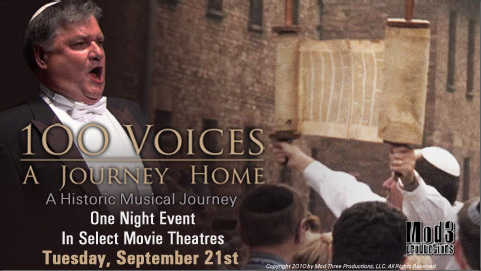 The interviews and personal stories are compelling but it is the music that makes 100 Voices: A Journey Home required viewing. Contact your favorite cantor and ask if she/he is organizing a group viewing. Showing on September 21 in Bellingham, Boston, Braintree, Burlington, Dedham, Foxboro, Framingham, Hadley, Lowell, Marlborough, Millborough, Millbury, Randolph, Revere, Swansea, and West Springfield.